Teachers at our school have spent a lot of time finding great learning games for our kids. This week, my friend McKenzie popped in at lunch with Sumoku, a new math game she had purchased for her 3rd graders. She wanted to learn how to play the game so we figured it out together and I LOVED it. 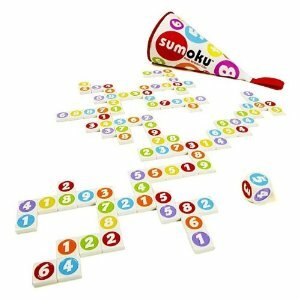 Sumoku is made by Blue Orange USA--this company has lots of great games that are fun, unique, and reasonably priced. First of all, let me say I loved the whole design of the game. It comes in a cone shaped zipper pouch with lots of colors. I love the size, color and texture of the tiles. And I love the font of the numbers on the tile. I have not seen the stand that carries these in bulk in stores, but I saw a photo on the site and I love that too. Overall, the game has a really fun, happy feel to it. This is a math game, recommended for ages 9-adult. It seems perfect for kids in grades 3-6. I made my husband play a game with me when mine arrived from Amazon today and he enjoyed the game too. Definitely a fun challenge. And it is not a game that takes forever to play. Love the looks of this game, strategy thinking and math. Our house needs one too! This looks great. I'll keep it in mind for when my 6yo is ready. Right now we've been playing Shut the Box to work on her basic addition skills (Blue Orange makes a version of this classic game - Double Shutter). In Shut the Box, there are tiles from 1-9 which flip up and down. You roll two dice and flip over the numbers which equal what you rolled (e.g., you roll a 7, you can flip down 7 or 5 and 2 or 6 and 1 or 4 and 3). When you roll a number for which you can't flip any tiles (e.g. you roll a 6 but 6, 5, 1, 2 and 4 are already flipped), the turn passes to the next person and your score is the sum of the remaining tiles. The winner is the person with the lowest score. If you managed to flip all the tiles (or "shut the box") your score is zero. Cool idea for learning math---without knowing you are learning. I can see how that could appeal to kids who don't often go for learning drills. I love tiles. Love how they feel and sound! This one is going on the family list. Do you have ZIP IT? That's a winner too. Thank you! a. A Wrinkle in Time, cont.